‘While ’40 Act alternatives are still a small part of the overall US mutual fund industry, their asset base is growing rapidly, especially compared to the growth in the more mature HF industry,’ says Barclays in a study report. During 2000 tech bubble and 2008 financial crisis, many investors lost heavily in stocks and bonds. Investors started looking for new ways to diversify their portfolios. They wanted some alternative investment avenues with lower market risk. Alternative Assets such as private equity and hedge fund attracted investments as these have lower correlation with the broader equity and bond markets. Alternative investments help in diversifying the portfolio and reduce exposure to market volatility and have different risk and return profiles. For example, hedge funds may protect capital during market downfall. However, alternative investments are generally illiquid and less transparent. They are mostly privately placed, transacted and less regulated. Minimum investment limit is kept high that restricts entry. These are considered more suitable for high-net-worth individuals and institutional investors. The common and small investors wanted liquid investment opportunities that could provide reasonable return with lower volatility. This gap was filled in by Liquid alternative investments. 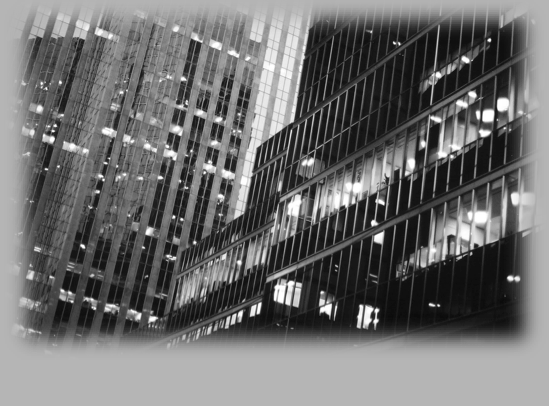 In the US, liquid alternative investments are offered as registered products under the Investment Company Act of 1940. These provide greater transparency, more liquidity and lower investment amount. These are traded on exchange and even small investors can easily access. Liquid alternatives offer better transparency through daily NAV disclosures. Liquid alternatives are more like exchange traded funds and mutual funds but have the benefits similar to the alternative assets. The performance of liquid alternatives in recent years has been better than ’40 Act products overall. Liquid alternatives use some of the strategies of alternative investments. In a way, the characteristics of liquid alternative investments are mix of the traditional mutual funds and modern alternatives. Alternatives asset managers package their strategies within the format of a mutual fund and offer as Liquid alternatives under the Investment Company Act of 1940. A ’40 Act fund can access retail distribution channels. Some hedge funds have developed products with minimum investments of as low as $2,500 for retail clients. 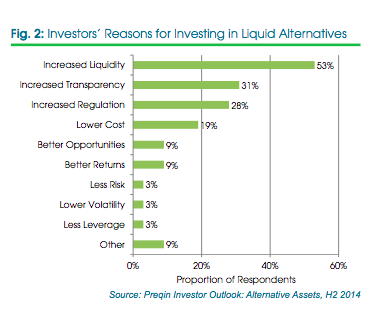 Institutional investors also now consider ’40 Act liquid alternatives as alternatives to hedge fund investments. Large investors find liquid alternatives as a regulated and liquid way of investing in hedge funds. The ’40 Act rules limits leverage to one-third and less than 15% exposure to illiquid assets. This has given impetus to its assets growth, particularly after 2008 financial crisis. As vetted by Preqin, institutional investors demand for more liquidity and transparency, and therefore demand for liquid alternatives is growing at a rapid speed. Since Liquid alternative is a ’40 Act fund that uses hedge-fund-like strategies, it is also known as “registered alternative”, “hedged mutual fund”, “registered hedge fund” or “regulated investment company”. Liquid alternative is the fastest growing category of ’40 Act structures. Though in the US the liquid alternatives sector with $137 billion asset is still in infancy, but it is growing exponentially. The leading market analysts such as McKinsey, Barclays Prime Services and Citi Prime Finance predict the inflows to cross $900 within one, two or three years. While Barclays Prime Services expects this level by 2018 and Citi Prime Finance by 2017, McKinsey is very optimistic with its projections to approach $900 billion by Dec 2015. According to a survey by Preqin, over half of the respondents do allocate, or plan to allocate, to liquid alternative funds. This indicates that this asset class is here to stay. Liquid alternatives assets increased by 43 percent compared to 15 percent growth in hedge fund assets in 2013. They are going to be more competitive with hedge funds and their fees are lower than that charged by hedge funds and performance fees are also not charged. The growing preference for liquid alternatives may pose new challenges to hedge funds in fund raising. To conclude, liquid alternatives carry benefits of alternative investment strategies together with liquidity, transparency and lower entry barriers. They provide some protection from market downfall. However it needs to be noted that liquid alternatives also carry risk depending on the strategies adopted by the fund managers.